The world-famous brandy that enjoys a loyal following, gained after soldiers returning from the two World Wars brought their affections for Asbach home with them. 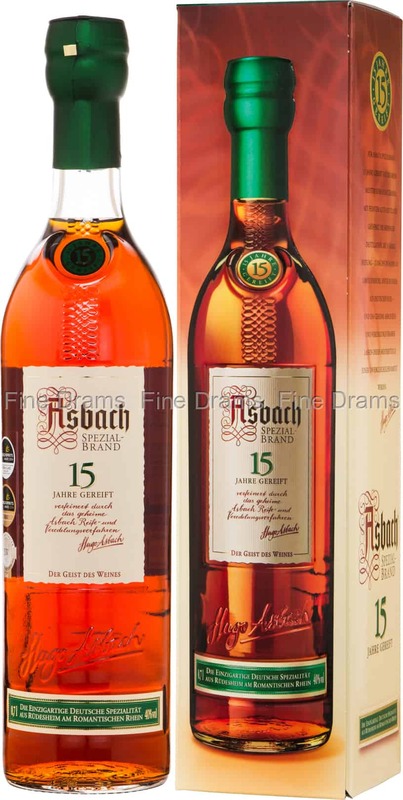 Asbach’s history begins in 1892, when Hugo Asbach left his homeland of France to establish a brandy making venture in Germany. He named his spirit “Weinbrand”, a sort of German equivalent to Cognac – which was used widely by German distillers, despite not being produced in Cognac. However, after the First World War, Germans were prevented from naming their spirit Cognac, whilst “Weinbrand” was already very familiar to German drinkers, placing Asbach in an enviable position. The brandy is made with wines produced around Europe, which are then shipped to Germany for final distillation in copper pot stills and aging in Limousin Oak for 15 years. The result is a remarkably fruity brandy, packed with floral flavours and notes of grapes, apples and pears, melon, dried fruit, oak, chocolate, cedarwood, toffee and juicy citrus.